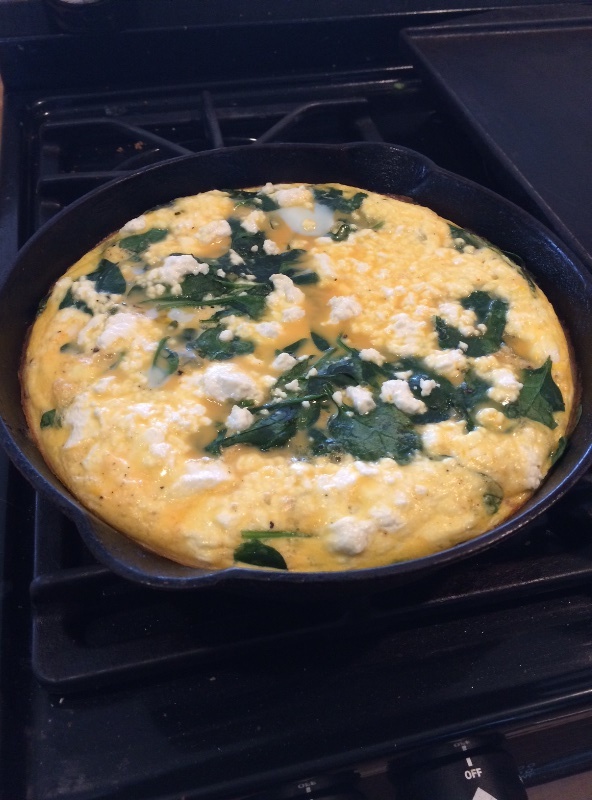 Since I learned about the wonder of frittatas about 6 months ago (basically a crustless quiche), we have eaten variations of frittatas in our house nearly every week – I’m not even exaggerating that claim! Harvey absolutely loved this particular recipe for a long time, so usually he and I could eat the entire pan in 2-3 days for breakfast. This meant that for a while I’d even make it twice a week. Sometimes I’ll throw some cherry tomatoes on top just before putting it in the oven, use herbed goat cheese instead of plain, or mix some crispy crumbled bacon into the egg mixture for variety (#WeLoveBacon), but I use the same basic recipe nearly every time. Enjoy! Start by pre-heating the oven to 425F and warming 4 teaspoons of oil in your cast iron skillet on the stove over medium heat. While that is warming up, I quickly peel and dice the sweet potato. When I add the potato to the skillet, I toss to coat in oil and then add the cumin and a little bit of salt and stir to coat. It usually takes that mixture around 15 minutes to cook, stirring occasionally. 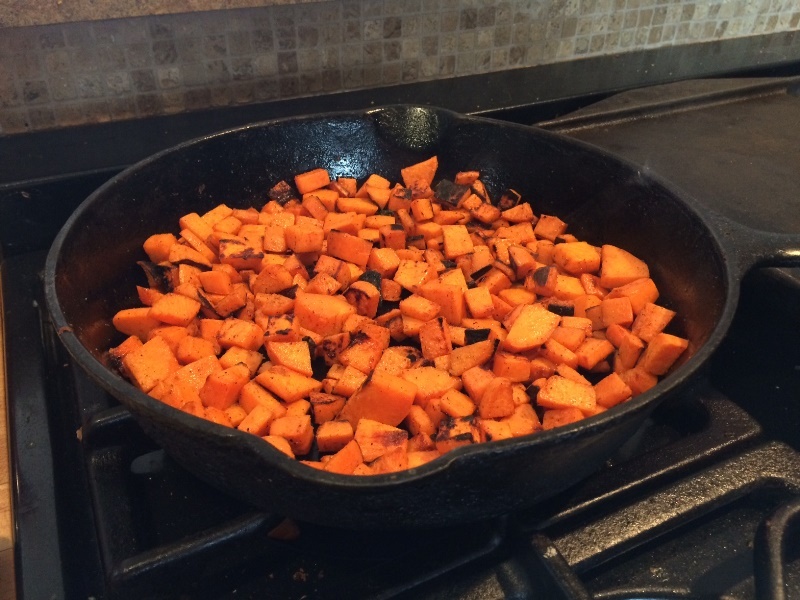 With the cast iron skillet you get those yummy black charred pieces on the potatoes which are delicious, and you can put the entire thing in the oven when it’s ready to bake, which means fewer dishes for me. It’s a win/win! While that is cooking, Stella helps me make the egg mixture. She is a champion egg cracker at this point! We add the eggs, milk, a pinch of salt & pepper, and a bunch of hot sauce (10-15 splashes, we love the flavor!) to a large bowl and whisk it all together. When the potatoes are cooked through, I sprinkle the thinly sliced green onions and the raw baby spinach on top of the potatoes and cover with a lid until the spinach wilts. Sometimes I’ll put a splash of water in the pan to help this process along. If I’m out of fresh spinach, I’ve even used frozen spinach which I’ve thawed and squeezed the water out of for this step. 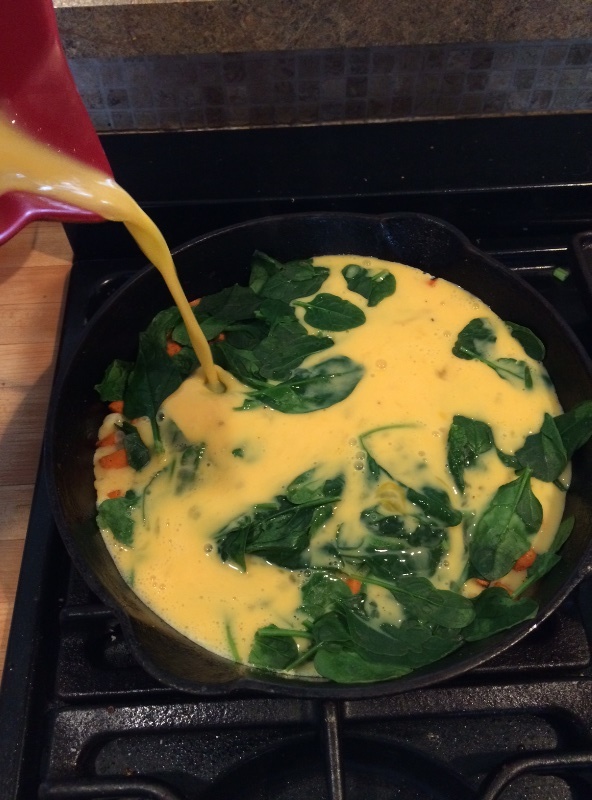 Turn the heat to low and pour your egg mixture over the top of the spinach. Crumble 2-3 ounces of goat cheese on top of the entire dish. Put the cast iron skillet in your oven and bake until the middle has just a little bit of jiggle left to it. That’s usually around 15 minutes for me, but I’m at high altitude (7,000’) so I don’t know if that changes things? You don’t want to overcook the eggs or it dries out really quickly; remember that the egg mixture will continue to cook and set for a few minutes after you take it out of the oven. In my opinion, this dish is just as good cold as it is hot! I often prep it on a Sunday and then have it in the fridge to pull out for quick breakfasts before work during the week. Sometimes I’ll warm it up in the microwave for a bit (remember the eggs will set even more if you do this) and other times I’ll just eat it cold. I did the calorie / container breakdown based on 4 servings, but this could easily be split into 6 servings (215 calories/each) and served with a slice of crispy toast as well. One final variation is to put the cooked sweet potatoes into the bottom of muffin tins and add the spinach/egg mixture on top (topped with crumbled goat cheese/bacon/etc) to make them individual mini-frittatas. When I do that I usually toss them into the freezer afterwards and then microwave them a couple at a time to eat when I’m in a rush. 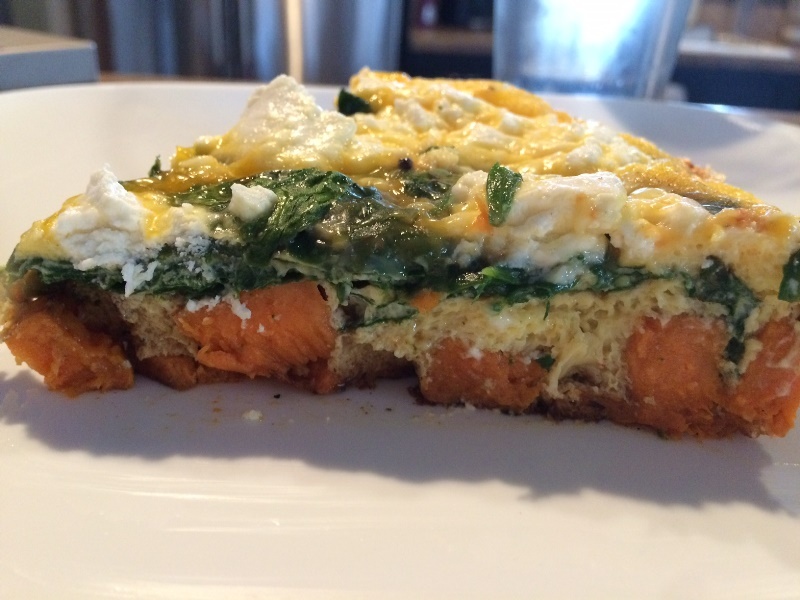 How about you – how do you eat your frittatas? Um, YUM! Totally going to be making this!! Love these new Fix recipes to try! WELP. I’ll be making this tomorrow night! Need some yams up in here. Looks delish! What size pan are you using? Not sure – the only cast iron skillet I own. I believe it’s a 10″? I can check tonight when I get home. YUM!! Too cute that your daughter helps you!! Oooh, thanks for sharing! Especially the part about the container equivalents. I’m super lazy about figuring those out… And good to know you can do it in muffin tins too. I have a similar crustless quiche recipe that I make in muffin sizes for quick breakfasts. Since I don’t have a cast iron skillet, it’s good to know this will work in those too! I kind of think goat cheese makes everything better, yes? Yep, I’ve made it in a regular skillet too, and once the sweet potato is browned, transferred everything to a pyrex or whatever to cook in the oven as well. It’s just easier to be able to move the pan straight to the oven! That’s like 37 more steps than anything I make 🙂 What does H do when you’re cooking? Dude, I am NOT a big cook, and this is so easy I have it memorized and it only takes me a few minutes to prep and put in the oven. Try it a couple of times! Brian makes frittatas and they’re just ok. He modifies them too much sometimes. I’m not the biggest fan, but I’m also not an egg person unless it’s fried hard and on a sandwich! I make tortilla Espanola once in a while which is like a frittata in my mind. I prefer it cold! I would probably like this frittata cold too! I don’t like fried hard really, but that’d be easy enough to replicate with this just by cooking a couple of extra minutes. The sweet potatoes are a nice addition by being a really healthy crab. You should try it! This looks SO good. Unfortunately, DH got food poisoning from quiche and threw up all across Europe five years ago and STILL won’t eat eggs. Sad face!